The practice of using threads to lift skin started in 1996 with Dr. Marlen Sulamanidze of Russia when he used a directional cog thread called Aptos® Thread (made of polypropylene) on the SMAS of the face and neck. The lifting procedure using Aptos® Thread spread rapidly over Europe and South America. Its biggest advantage is that it requires only local anesthesia, has immediate effect and a short recovery period of three days or less. Around 2009, Silhouette lift®, an anchoring thread technology with biodegradable cones along the thread to help collagen synthesis was also introduced. Polypropylene is known to cause minimal side effects, however, if it does not completely dissolve after absorption, it needs to be removed. Also, as it uses a thick cannula, various skin layers including the dermis, subcutaneous layer, etc. cannot be targeted. Around 2010, biocompatible threads made of absorbable material that can target various skin layers with less side effects began to be used. The most recent introduction in this field was a new bioabsorbable thread made of PDO (polydioxanone) called “Reandnè”. Whereas materials such as PGA, PGLA, and PGCL, etc. take 60-120 days to dissolve, PDO takes 180-240 days and can provide more long-term support to the skin. The four thread types of Normal, Tornado, Screw, and Cogged allow wider indications. The Normal Thread can be used for lifting as well as firming. The Tornado Thread consists of two twisted threads and can be applied to the SMAS layer. 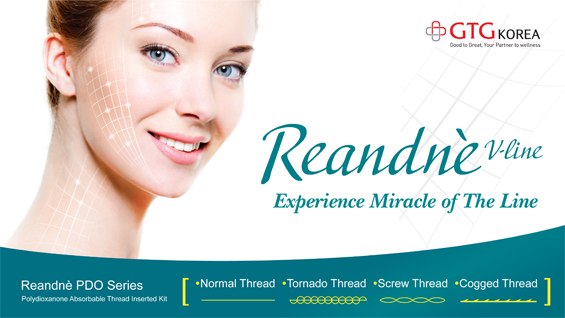 The Screw Thread more strongly stimulates collagen synthesis compared to the Normal Thread and can be applied to muscles. The Cogged Thread is the strongest thread used for pulling the droopy skin around the jaw line and nasolabial folds.